It’s the most wonderful time of the year for all the family, including our dogs. So, it’s important that everyone is treated with a special gift or two. Our Christmas gift guide is packed full of exciting toys and treats your dogs are guaranteed to love, whether you’re looking for small stocking fillers or bigger buys. 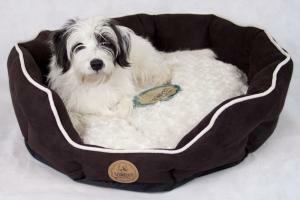 VioPet Beds – with four different designs to choose from, there is a bed for every dog. Whether they like to spread out or curl up, our popular range of comfortable, characterful beds are the perfect addition to every home and will keep your pooch cosy and rested through the festive season and beyond. What’s even better is that you will now receive a free bag of VioPet treats with every VioPet bed, until the end of December. Forthglade Christmas Treats – perfect for training or treating over the festive period, these delicious limited-edition treats are hand-baked, heart-shaped and packed full of flavoursome ingredients, including turkey, cranberry and parsnip. Lily’s Kitchen Christmas Biscuit Tin – treat them to something truly special this year with the Lily’s Kitchen Christmas Biscuit Tin, containing a selection of delicious treats and training treats. This delicious selection includes gingerbread dogs, turkey and cranberry biscuits, cheese and apple training treats, salmon shortbread fingers, whitefish and seaweed rusks, and fishy turmeric bites. You’ll also find some Lily’s Kitchen favourites in there too, including Rise & Shines, and Bedtime Biscuits. Companion Dog Treat Cracker – involve your dog in the Christmas meal-time fun, with a cracker of their very own! Containing tasty chicken and beef gravy bone treats, these delicious snacks are suitable for any breed of dog and would also make a great stocking filler. VioPet Training Treats – dogs can’t resist these soft and deliciously meaty treats, packed with 85% meat and high in protein. Free from all cereals and artificial colours and flavours, they are the perfect reward to help reinforce training over the festive period. Even better - your dog can now enjoy 3 bags for the price of 2! Rosewood Christmas Festive Cape - this super soft Festive Cape will have your dog prancing about on Christmas Day looking like “the fairest of them all”. Perfect for shorthaired breeds that need a little added warmth, or those that just like to look their best, this is now on special offer until the end of December. Lily’s Kitchen Christmas Spectacular Treats – this charming Christmas cracker box is filled with tasty delights, including hand-baked turkey, cranberry, thyme and cinnamon treats. A crowd-pleaser and a wonderful present for friends’ dogs or your own.